The Suna and Inan Kirac Foundation sponsored a recent meeting held in Istanbul, Turkey on July 19-21, 2009, where international scientists gathered to discuss Stem Cells, RNAi and Neurodegeneration. The conference opened with talks focusing on the development of motor neurons and moved on to topics covering disease pathogenesis and potential therapeutic approaches for neurodegenerative diseases, with an emphasis on ALS. Selected talks with ALS relevance are presented below. Tom Jessel and Jeff Macklis discussed transcriptional mechanisms controlling specification of two types of neurons affected in ALS, motor neurons in the spinal cord and corticospinal motor neurons (CSMNs) in the brain, respectively. Understanding the molecular (transcriptional) controls that govern motor neuron development and survival is fundamental to deciphering the mechanisms underlying disease pathogenesis and developing appropriate assays and/or therapies for ALS. For example, the ability to direct differentiation of neural stem cells (by turning on/off transcription factors) into specific neuronal subtypes is critical for cell replacement therapeutic approaches. These differentiated cells can also serve as a valuable tool for hi-throughput screening of candidate drugs. Thomas Jessel, Columbia University – The Origins and Implication of Motor Neuron Diversity. Jessel and colleagues wondered what would happen if subtype specification of spinal motor neurons was abolished. This was accomplished by targeting a single gene – FoxP1 (a Hox transcriptional co-factor)1. A gradient of FGF along the rostral-caudal spinal cord activates different sets of Hox genes to specify different motor neuron subtypes. Conditional ablation of FoxP1 in motor neurons was equivalent to eliminating all Hox gene expression in spinal cord motor neurons. Lack of motor neuron specification caused severe paralysis in FoxP1 mutant mice. Further characterization showed that unspecified motor neurons still extended axons, which reached muscle targets and formed functional neuromuscular junctions. (Remarkably, axonal fiber tracts appeared relatively normal, with only subtle pathfinding errors.) However because motor neurons lacked subtype identity, they were not organized into functional pools. Normally, cell bodies of motor neurons residing in the spinal cord are organized according to their subtype, such that each particular pool of neurons extends axons that innervate a particular muscle group. Distinct pools of motor neurons are activated by upstream inputs from sensory dorsal root ganglion neurons and interneurons to achieve coordinated control of antagonistic muscle groups. In the FoxP1 mutant mice, mixed pools of motor neurons were found to innervate multiple muscle groups. Activation of these mixed pools by upstream signals resulted in the miscoordinated activation of antagonistic muscle groups and the observed movement defects in mutant mice. Jeffrey Macklis, Harvard University – Molecular Development of Corticospinal Motor Neurons. The Macklis group has focused attention on identifying critical transcription factors regulating specification of cortical projection neurons. Using FACS-purified CSMNs and other cortical projection neurons, Macklis and colleagues identified developmentally regulated transcriptional factors that specified distinct neuronal subtypes2. These studies identified the gene forebrain embryonic zinc- finger-like (Fezl) to be a critical determinant of CSMNs and other subcerebral projection neurons. Subsequent analysis of Fezl deficient mutant mice showed absence of these neuronal populations, confirming the critical function of this gene for cell fate specification3. The therapeutic implications of Macklis’ work suggest that degenerating CSMN’s in ALS could potentially be replenished by manipulating Fezl expression in endogenous progenitors. P. Hande Ozdinler, Northwestern University – Upper Motor Neuron Biology: What can we learn from a Single Neuron? Lower motor neuronal defects have been widely reported in ALS mouse models whereas ALS patients exhibit defects in both upper and lower motor neurons. Ozdinler took a closer look at the brains of G93A hSOD1 mice and showed that CSMNs in layer V and some subcerebral projections were affected while interneurons were unaffected. Widespread activation of astrocytes and microglia was also seen throughout the brain. Ozdinler and colleagues also examined ALSIN2 deficient mice but these mice did not show robust CSMN degeneration. In the future, building on her work with CSMNs, Ozdinler is also hoping to identify biomarkers for ALS by analyzing mRNA from pure populations of CSMNs isolated from SOD1 mouse models and comparing these with other neurodegenerative disease models. She hopes to identify common and unique features that can be diagnostic for ALS cases. Robert Brown, University of Massachusetts Medical School – Lessons from ELP3 FUS and TDP-43 – is RNA Metabolism Disturbed in ALS? Robert Brown reflected on the growing list of genes thus far associated with ALS and recognized two themes shared among several of them, namely (1) many genes are involved in axonal transport and vesicle trafficking and (2) many genes are involved in RNA metabolism and transport . Both anterograde and retrograde transport have been implicated, for example, by the association of mutations in dynactin, the retrograde transport motor protein, and KIFAP3, identified in sporadic ALS and shown to impair anterograde transport. Vesicle trafficking has been implicated by the identification of mutations in SAL3, which leads to defects in late endosomal trafficking. Interestingly, Brown called mutant SOD1 a “modifier of transport” because of its ability to impair the function of axonal kinesin and slow anterograde transport. More recently, the identification of FUS, TDP-43, and ELP3 mutations linked to ALS have focused attention on RNA metabolism and RNA transport-mechanism disturbances associated with ALS pathogenesis. FUS, an RNA binding protein, functions in diverse processes including dendritic development where it has been reported to affect5 RNA transport and local protein synthesis, processes important for dendritic spine plasticity. TDP-43 is an RNA binding protein normally localized to the nucleus, but frequently mislocalized in disease, whose function(s) in neurons remains to be elucidated. Finally, ELP3, a component of the ELONGATOR histone acetylase complex, functions to acetylate histones and regulate gene expression. It has been associated with motor neuron degeneration in humans, flies, and zebrafish. Eran Hornstein, Weizmann Institute – The Role of MicroRNA in Development of the Neuromuscular Junction. The recent identification of FUS and TDP-43 as ALS-associated genes suggests an important role for dysregulation of RNA metabolism in disease pathogenesis. Hornstein’s investigation of the role of microRNAs in development of the neuromuscular junction provided additional evidence in support of the involvement of RNA metabolism in disease pathogenesis. He showed that ablation of Dicer (the enzyme that processes immature microRNAs into their mature form) in motor neurons can cause motor neuron disease in mice. Closer examination revealed degenerating neurons and muscular atrophy. The stoichiometric ratio of neurofilament subunits was disrupted in the Dicer mouse model, a pathology previously implicated in motor neuron disease. Furthermore, Hornstein showed that the the molecular mechanism underlying neurofilament dysregulation is related to miR9, a neuronal miRNA. These studies indicated that improper RNA metabolism could cause motor neuron disease and highlighted miR9 as worthy of further study. To determine if there was a functional relationship between miR9 and motor neuron diseases, Hornstein and colleagues next looked at miR9 expression in a mouse model of spinal muscular atrophy. His finding that miR9 is downregulated also in this model, supports the hypothesis that RNA metabolism is involved broadly in motor neuron disease pathogenesis. Serge Przedborski, Columbia University – The Interaction of Astrocytes and Motor Neurons in ALS. Przedborski and colleagues studied embryonic spinal motor neurons expressing mutant SOD1 in culture to understand why these cells selectively die in ALS. They found that mutant SOD1 expression in motor neurons did not modify survival during a 14 day culture period but did alter some morphometric parameters (shorter axonal length and smaller cell body diameter of mutant motor neurons). While it can be argued that the culture period was not long enough to assay survival effects, Przedborski noted that a much stronger death phenotype was seen during the same time period when mutant neurons were co-cultured with mutant glia. These results do not exclude the cell autonomous effects of mutant SOD1 on motor neurons but underscore the significant effect(s) mutant glia exert on motor neurons. Importantly, this non-cell autonomous effect is physiologically highly relevant given the intimate association of motor neurons and glia in vivo. Additional work showed that toxicity was conferred by a factor secreted specifically by astrocytes, demonstrated by the finding that media conditioned by mutant astrocytes, but not mutant microglia, fibroblasts, cortical neurons, or myocytes, is toxic to motor neurons. Przedborski’s group has intensively searched for this elusive secreted toxic factor and has tested a plethora of candidate molecules, including reactive oxygen species and nineteen different cytokines, but none has yet been shown to be toxic in his culture system. He is also taking an unbiased approach and using gene profiling of astrocytic arrays to identify the toxic factor. This work is currently in progress. Biochemical analysis of mutant astrocyte conditioned media has narrowed down the identity of the toxic factor to be a highly negatively charged 9-14kDa protein/peptide. Pro-neurotrophins fall into this category but blocking of some pro-neurotrophins did not mitigate toxicity in this culture assay. Once identified, neutralizing this astrocytic toxic factor is anticipated to be an effective therapeutic approach. Kevin Eggan, Harvard University – Using Reprogrammed Fibroblasts to Understand the Cell Biology of ALS. Kevin Eggan is one of the scientists pioneering the use of induced pluripotent stem cells (iPS) for the generation of ALS patient-specific motor neurons. He is currently generating iPS cells from fibroblasts from healthy controls and ALS patients (including patients with both sporadic ALS and familial ALS with SOD1 mutations). Among other uses, these cell lines will likely be a critical resource for screening drug candidates. In other work, Eggan and colleagues studied wildtype motor neurons derived from human embryonic stem cells that were co-cultured with glia derived from either SOD1 mutant mice or wildtype controls6. These studies recapitulated previous studies showing non-cell autonomous toxic effects of mutant glia upon motor neurons and supported the hypothesis that mutant glia secrete a toxic factor that kills neighboring motor neurons. Global gene expression profiling from SOD1 mutant glia revealed upregulation of the prostaglandin D2 receptor. They showed that the toxic effects of mutant glia on motor neurons could be blocked by the addition of prostaglandin receptor antagonists. Eggan plans to further test this finding by mating the SOD1 mice to prostaglandin receptor DP1 deficient mice. Justin Fallon, Brown University – Regulating Synaptic Architecture: Presynaptic Fragile X Granules and Postsynaptic Biglycan. Motor neuron death in ALS begins with destruction of the neuromuscular junction (NMJ) and degeneration of the distal axon. Justin Fallon’s research on NMJs may offer a potential therapy for ALS patients. Fallon and colleagues found that biglycan is an important regulator of the utrophin protein complex in muscles during early postnatal development. In mature animals, biglycan was found to stabilize the NMJs formed between motor neurons and muscles. Fallon found that systemic delivery of recombinant human biglycan upregulated utrophin and improved muscle function in mdx mice (a mouse model for Duchenne Muscular Dystrophy). Stabilization of NMJs may offer therapeutic potential for ALS patients, as well. Zuoshang Xu, University of Massachusetts Medical School – RNAi Therapy in ALS – Ready for Clinics. Development of efficacious ALS therapies has been impaired by the fact that the mechanism by which mutant SOD1 confers toxicity is unclear. To circumvent these challenges, Xu and colleagues utilized an RNAi approach to silence mutant SOD1 before it could exert its toxic effects on cells. Chemically modified siRNAs were designed to specifically target mutant (but not wildtype) SOD1 transcripts and were shown to be stable enough to enable long-term potency in mice7. Delivery of these siRNAs by infusion into the spinal cord of SOD1 mice slowed disease progression and improved survival. Viral delivery of RNAi therapy was also shown to be efficacious. – Sheila Menzies, PhD, Scientific Program Officer at Prize4Life. 1. JS Dasen, A De Camilli, B Wang, PW Tucker and TM Jessell. Hox Repertoires for Motor Neuron Diversity and Connectivity Gated by a Single Accessory Factor, FoxP1. Cell 134, 304-316 (2008). 2. P Arlotta, BJ Molyneaux, J Chen, J Inoue, R Kominami and JD Macklis. 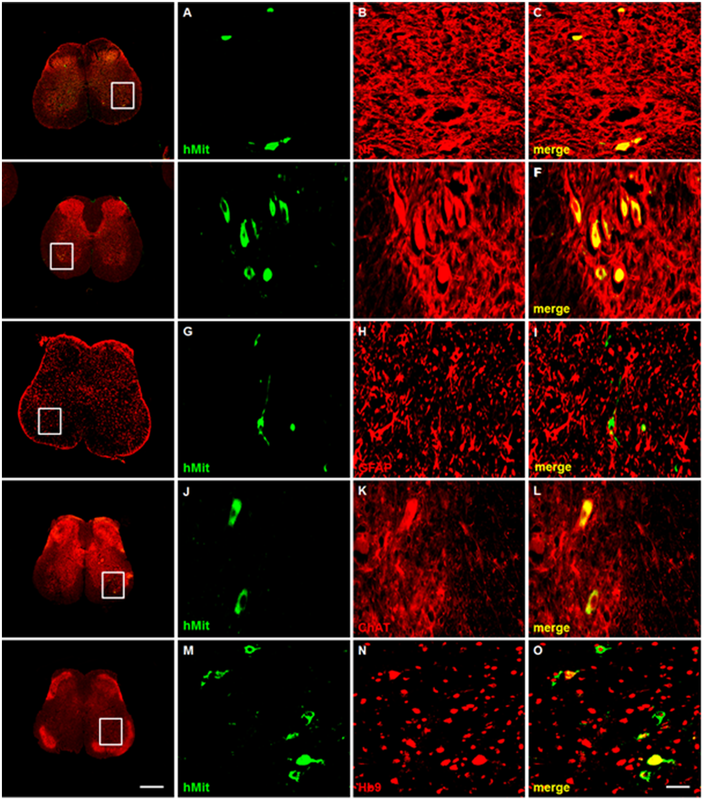 Neuronal Subtype-Specific Genes that Control Corticospinal Motor Neuron Development In Vivo. Neuron 45, 207-221 (2005). 3. BJ Molyneaux, P Arlotta, T Hirata, M Hibi, and JD Macklis. Fezl Is Required for the Birth and Specification of Corticospinal Motor Neurons. Neuron 47, 817-831 (2005). 4. M Nagai, DB Re, T Nagata, A Chalazonitis, TM Jessell, H Wichterle, S Przedborski. Astrocytes expressing ALS-linked mutated SOD1 release factors selectively toxic to motor neurons. Nat Neurosci 10(5), 615-22 (2007). 5. R Fujii, S Okabe, T Urushido, K Inoue, A Yoshimura, T Tachibana, T Nishikawa, GG Hicks, T Takumi. The RNA binding protein TLS is translocated to dendritic spines by mGluR5 activation and regulates spine morphology. Curr Biol. 29;15(6):587-93 (2005). 6. FP Di Giorgio, GL Boulting, S Bobrowicz, and KC Eggan. Human Embryonic Stem Cell-Derived Motor Neurons Are Sensitive to the Toxic Effect of Glial Cells Carrying an ALS-Causing Mutation. Cell Stem Cell 3, 637-648 (2008). 7. H Wang, A Ghosh, H Baigude, CS Yang, L Qiu, X Xia, H Zhou, TM Rana, Z XU. Therapeutic gene silencing delivered by a chemically modified small interfering RNA against mutant SOD1 slows amyotrophic lateral sclerosis progression. J Biol Chem. 283(23):15845-52( 2008).